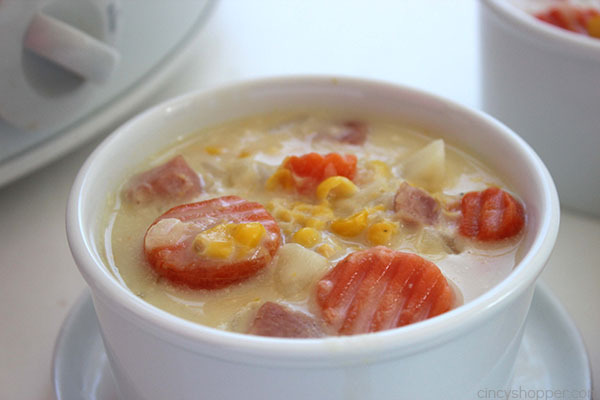 If you are needing an easy dinner idea, this Slow Cooker Corn Chowder is super simple. 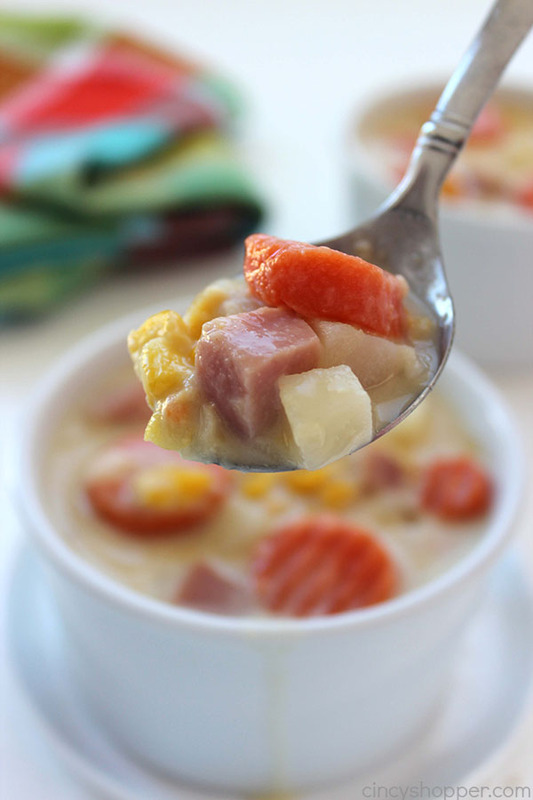 Since our recipe uses frozen potatoes, corn, carrots, and then precooked ham, it comes together quickly. You can have dinner cooking in your Crock-Pot in no time at all. 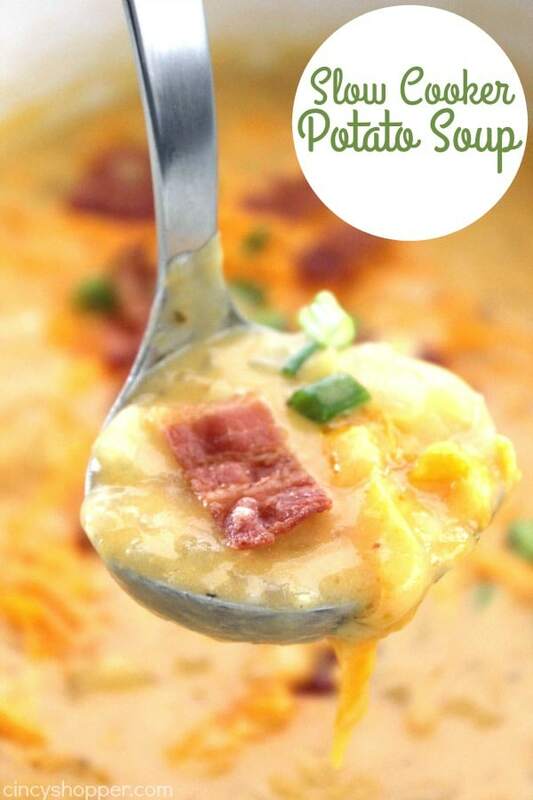 Comforting soups are always a favorite dinner idea for us during the colder months. 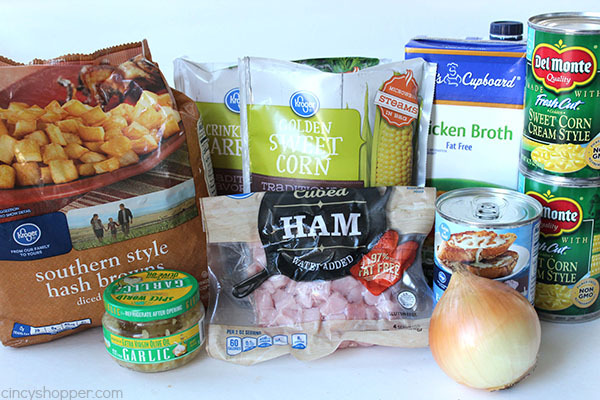 I can make slow cooker soups with not much effort and I always have plenty to feed this crew. I serve the soup with a sandwich or bread along side and everyone gets filled up. 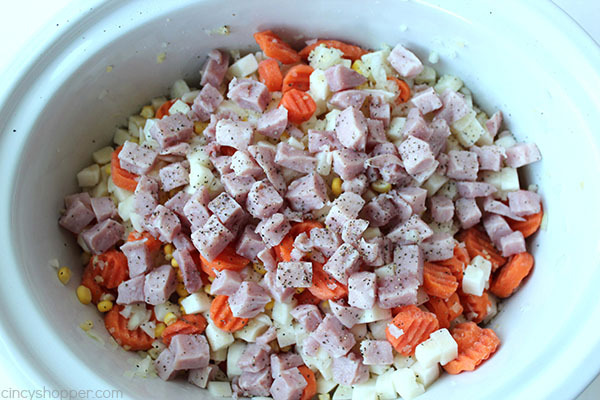 Since the weather is getting cooler, I decided it was time to start making all of our favorite slow cooker soups. 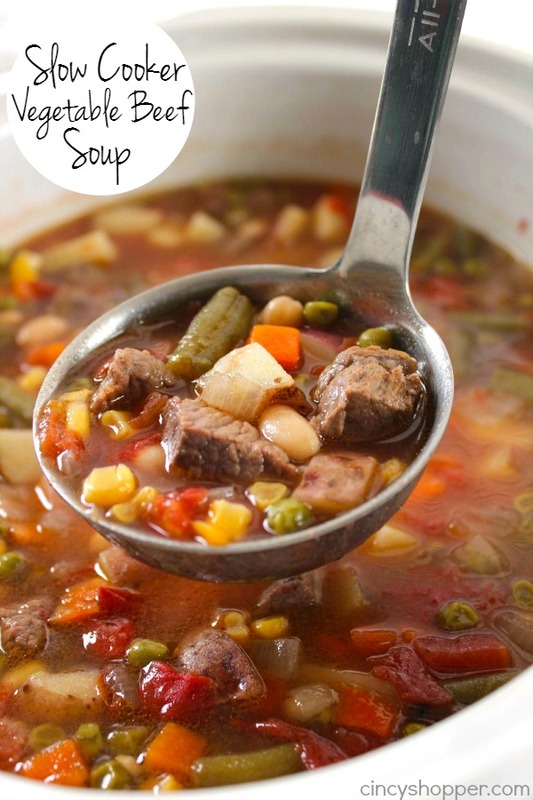 I make our Slow Cooker Vegetable Beef Soup most often. The whole gang loves it. 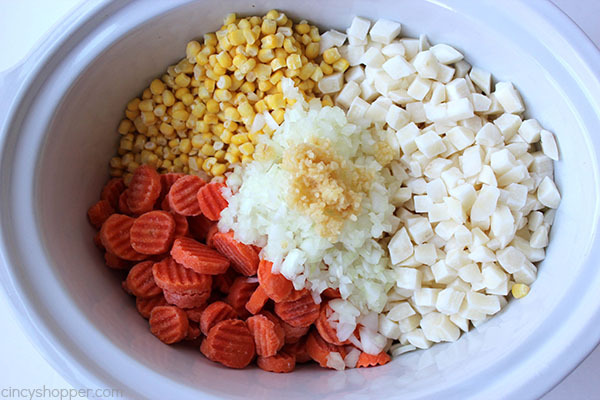 I really like making soups that are loaded up with vegetables. 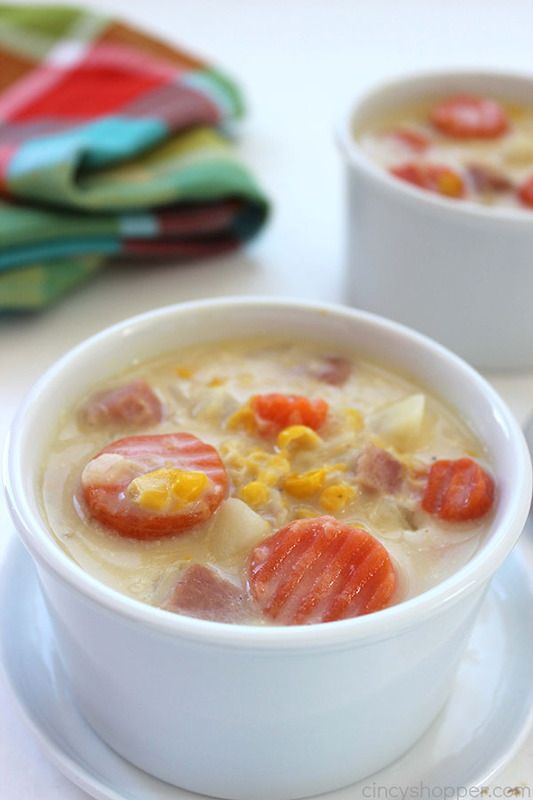 This Slow Cooker Corn Chowder is loaded up with corn (both whole and cream style), potatoes, and carrots. 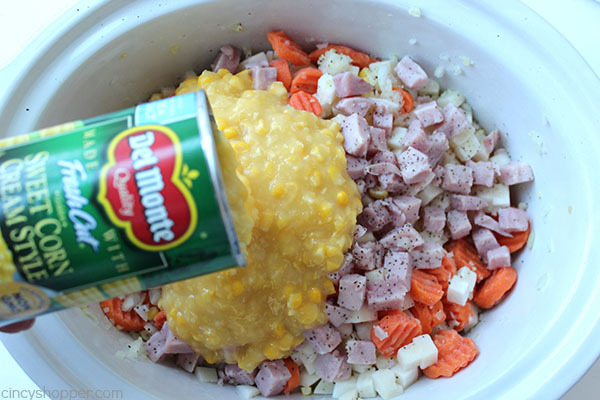 It is always great with easy store bought cubed ham, leftover ham, and also bacon. I use frozen veggies most times that I make this one. They make the recipe super quick and easy. I can toss all the ingredients in and allow our dinner to slow cook all day long. 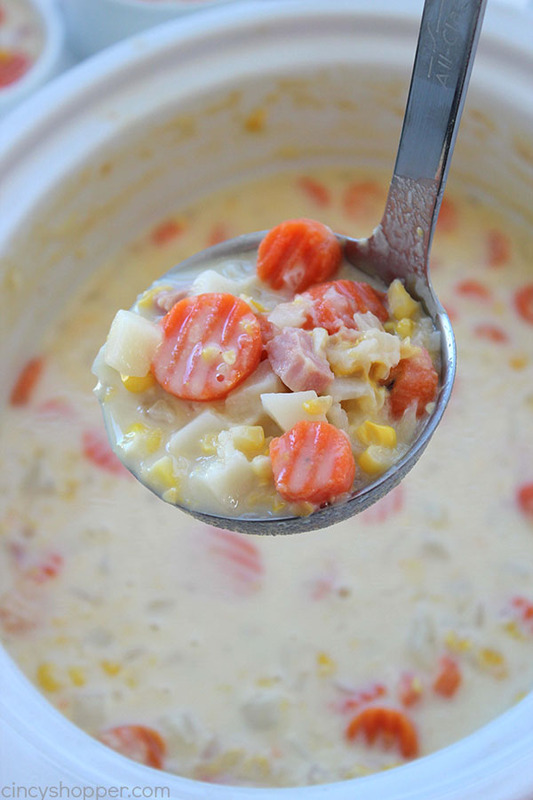 My Slow Cooker Corn Chowder can be made with either frozen or fresh veggies. 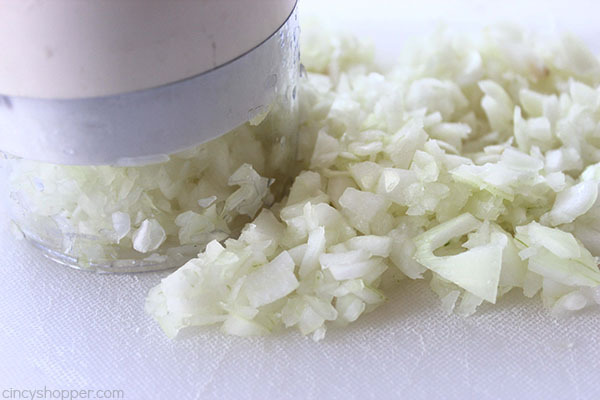 If you prefer to use fresh diced veggies feel free to use those too. 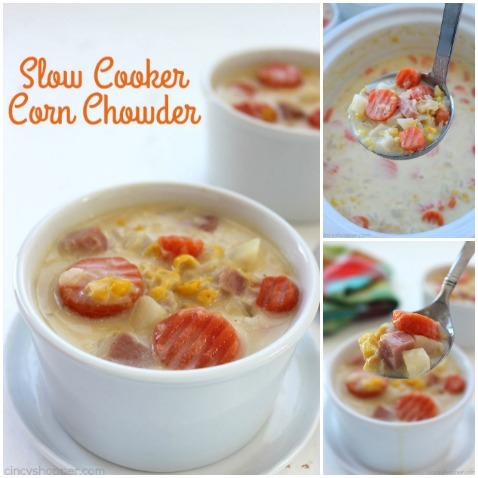 You will find the Corn Chowder filled with a great creamy flavor. SUPER YUMMY! 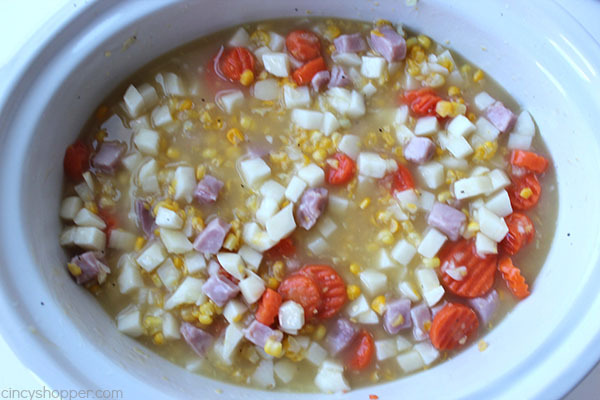 Add frozen potatoes, frozen corn, frozen carrots, onion and garlic to slow cooker. 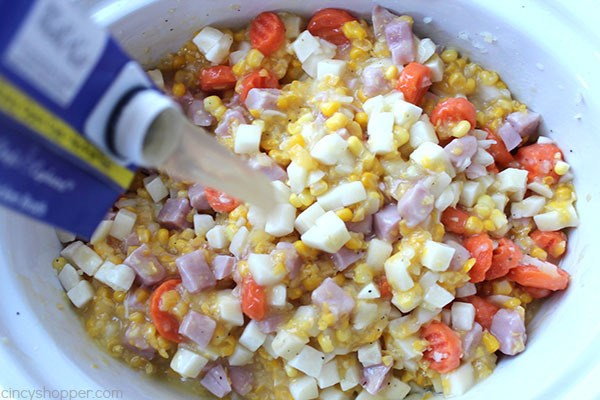 Add ham, cream style corn, salt and pepper. Cook on low for 6 hours (or high for 3-4 hours). 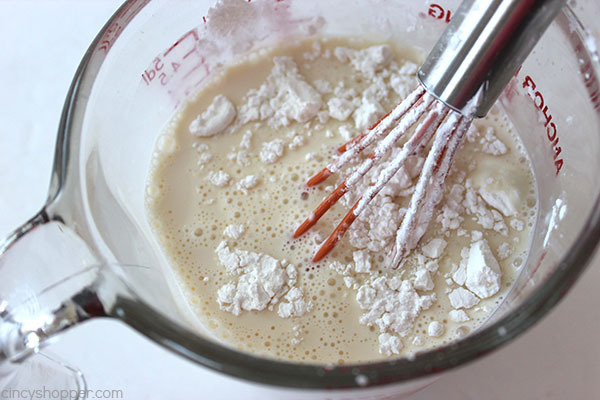 Whisk cornstarch into evaporated milk until dissolved. 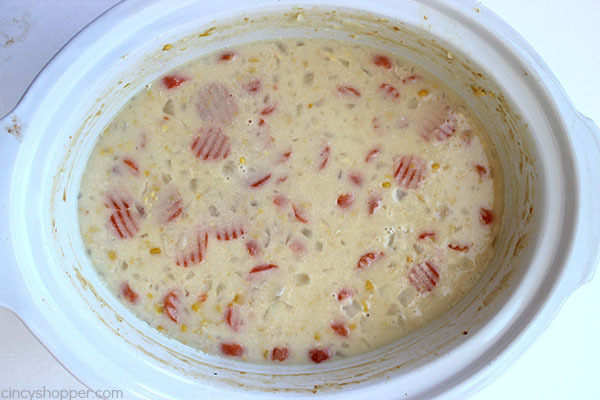 Add mixture to slow cooker and stir to incorporate. Cook on high for 30-45 minutes until thickened. 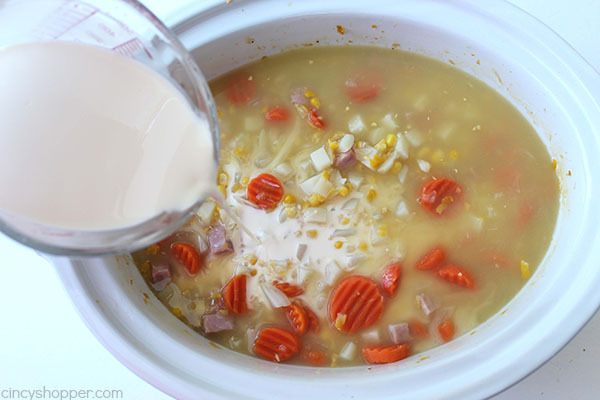 Do you have a favorite soup recipe that you make in your Crock-Pot? 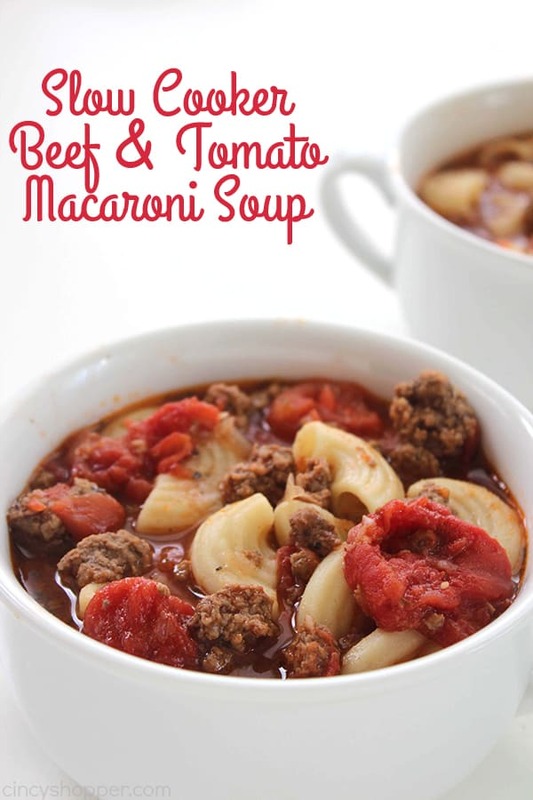 This looks amazing and so easy! Can’t wait to try it! I cannot wait for it to get cooler to be able to make soups. 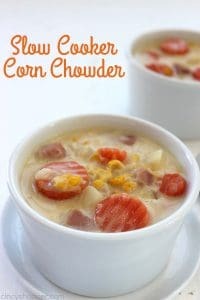 I have to stop by and see this corn chowder. It is one soup I have never made. It sounds extremely delicious. Sharing! I also visited several other posts to schedule pins.